Taglyan Cultural Complex is Delighted to be Featured on JuneBugWeddings.com! JuneBug includes All The Best…Everything! Find Taglyan Cultural Complex – Reception Sites: Los Angeles. 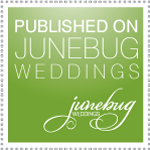 We’re Proudly Wearing Our New ‘Published On JuneBug Weddings Badge’. Taglyan Complex is a beautiful, upscale venue, reflective of Hollywood's Golden Era. Crowd management is professional; never intrusive. Guests are gently directed through a series of access points, so flow is efficient and controlled. On-site, underground parking is available. It is just a few steps from the car-drop to the building's entrance. Ramps are provided. The formal garden, is elegantly planted and accented with statuary and fountains. A covered patio, provides protection from the elements. Each holding area is beautifully decorated. The main room, with its complex mix of a backlit, stained glass ceiling and "fairytale"l chandeliers, has an open floor plan to allow for the requirements of individual events. And, just in case you're wondering, the carpet is elegantly soft and thick. Excellent sound and video support complements the well maintained surroundings. 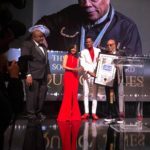 The cool, inconspicuous LED stage lighting is effective, never spilling on the brilliant, stage filling, projection screen. Hors d'oeuvre and drinks are served at this limited event. Service is friendly and helpful. A vegan fresh tomato bruschetta is one of four selections provided. The other three: chicken kabobs, beef kabobs, and crab cakes. Bathrooms are spacious with easy wheelchair accessibility. It's old Hollywood glamour and modern security complexly weaved, so the event remains center stage. This place is off the hook- awesome. It was amazing. The service was amazing, the food SO great, the venue prestine, these owners and employees care about their business and it shows in their presentation of the grounds and in the personal touch of their servers. Everything for Shiva and Hamid's wedding was perfect. We stayed so late and they were so gracious to accommodate us even past midnight. They did help us rap it up and let us know it was time to go home, but it was a much needed nodge is the right direction - "it's time to go now :)." We would've partied til we dropped. Persian Weddings are so cool. Phenomenal venue for any event. Beautiful, with great service and food. But found staff very efficient and attentive but a little closer on the stiff side. Beautiful venue, kind support staff with great attitudes but the valet service could improve overall. Including their attitudes towards paying patrons. I stood in the rain because the man wanted to wait for 2 claim tickets until he would retrieve my car, additionally I had to wait in my car while people who did not valet blocked the narrow exit while loading up various pick-up trucks. Still, I give 4 stars for overall experience. So you actually probably wouldn’t realize it was there unless you’ve been before because it’s in such an odd area but the complex itself is very beautiful. It has a nice set up and lots of places to take pictures indoors and outdoors. There is a cocktail waiting area which was nice to separate the party. Enjoyed my event here!